Visit Pantasina in the hinterland of Imperia during your stay in Liguria, Italy. The feast of Madonna della Guardia - always on the first Sunday in September. Chestnut festival - on the second Sunday in October. The Cian Zerbo music festival - always at the end of July/beginning of August on the meadows of Cian Zerbu, towards Colle d'Oggia. 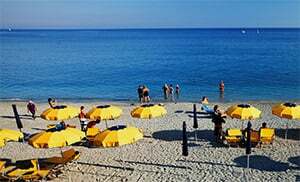 The economy of the area consists primarily of agriculture, mostly olives, but even tourism has played a not so insignificant role in the last few years through constantly rising numbers of guests who have spent their vacation in the area. In the past the village of Pantasina was part of Castellania Pietralata Superiore, and then it changed hands and came under the feudal rule of Signori di Ventimiglia before finally being taken over by the Lascaris family. It later belonged to the Savoy Royal Family, and then it became part of the kingdom of Sardinia before being integrated into the Italian Kingdom. It was an independent municipality until 1928, when it was then assigned to the municipality of Vasia. Pantasina lies in the Rio Del Crotto valley, on the left tributary of the River Prino. A large section of the area around Pantasina is planted with olive trees, while further up one finds chestnut woods alternating with wide lawns which are still used for sheep keeping. The following areas also belong to the municipality of Vasia: Pianavia (1.79 km), Prela' Castello (1.40 km), Torretta (1.23 km) – in brackets is the distance between Vasia and the respective locality). The locality of Pantasina has about 127 inhabitants and is located 433 m above sea-level.